Your time is valuable. So you plan out your period needlework projects carefully. Your choice of materials should be only the best, including DMC brand Medicis, a superior quality, non-divisible two ply wool yarn which is mothproof and colorfast. The word "crewel" comes from the Anglo-Saxon "cleow" meaning "ball of thread" and refers to a loosely twisted woolen yarn used to decorate the clothing of the" lower orders". Crewel embroidery has found its way onto curtains, household furniture, wallets, and needlebooks. It was and still is an enduring way for common home objects to become richer looking. #CWEY, Crewel Wool Yarn Color Card $2.75 ea. 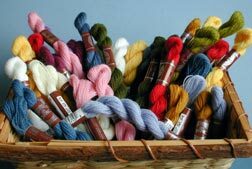 Our color selection is characteristic of crewel- soft muted shades replicating the vegetable dyed hues of historic samplers, bed hangings, and garments.